Can I add my DNA results in the Family Tree Builder software? At the moment, you can only upload autosomal DNA data to the online family site (FTDNA Family Finder, 23andMe personal genome service kit, and AncestryDNA kit), which will be later used for the DNA Matching technology. You can also upload the DNA file of a combination of the autosomal (Family Finder) test with another DNA test, but only the autosomal test can be used for DNA Matching. If you have created your family tree using our Family Tree Builder software, you will be able to add other DNA test results such as mtDNA / Y-DNA tests there. Please note, these results cannot be synced to your family site due to international privacy regulations. In order to add the DNA tests in Family Tree Builder, open the program on your computer and locate the person you would like to add the DNA results to. Click on the person card, and go to the ‘More’ tab. 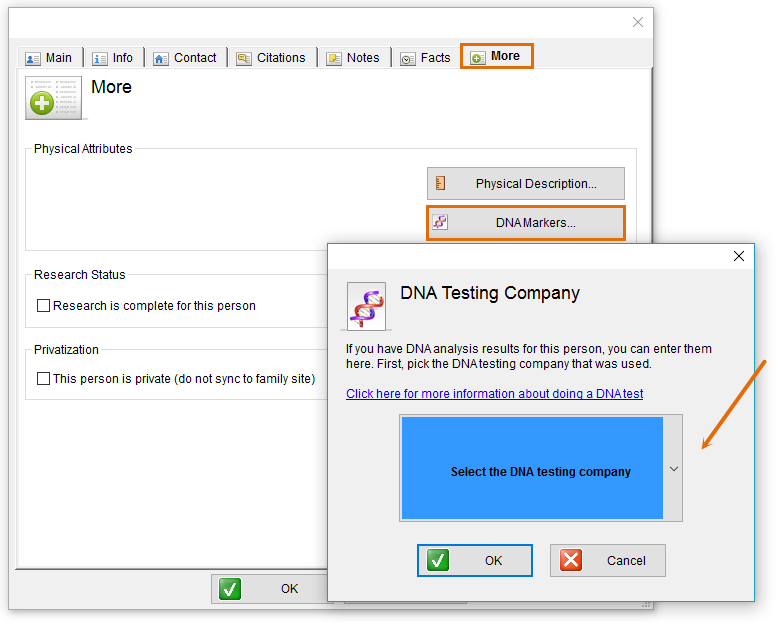 Here you can click on 'DNA Markers', select the DNA company that was used for the DNA test and click ‘OK’ to add the DNA markers.